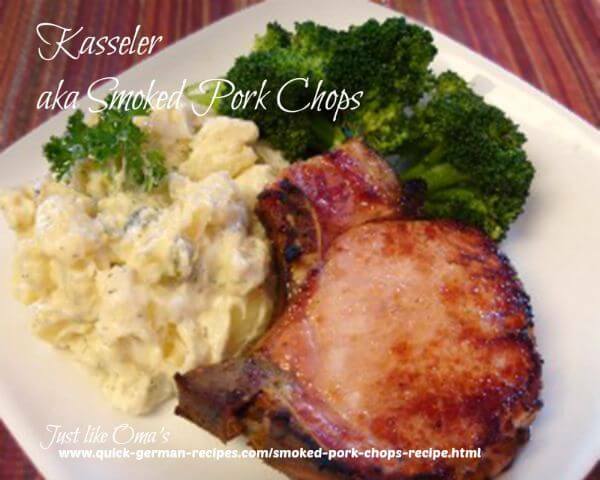 This smoked pork chops recipe is one of those traditional German food recipes that is so easy and quick to make. The only difficulty you may have is finding the meat. 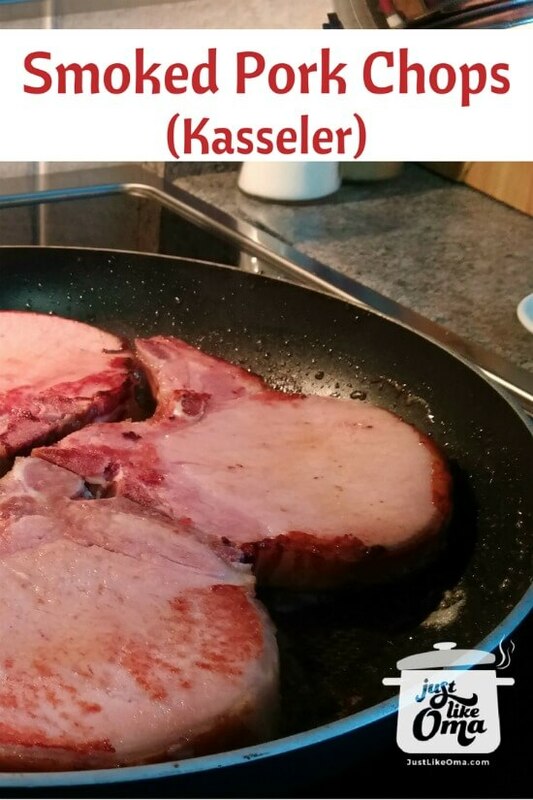 Most delis will have this - called "Kasseler" (or "Kassler") - it's a type of smoked pork loin chops. Can't find that? Check below for alternatives. Together with making the potato salad and broccoli, the quick German meal below was ready in under 30 minutes. A very traditional German Kasseler dinner! Heat oil and/or butter, about 2 Tbsp in a fry pan. Over medium heat, lightly brown Kasseler chops on both sides. Serve and enjoy. Great with German mustard, potatoes, and vegetables. 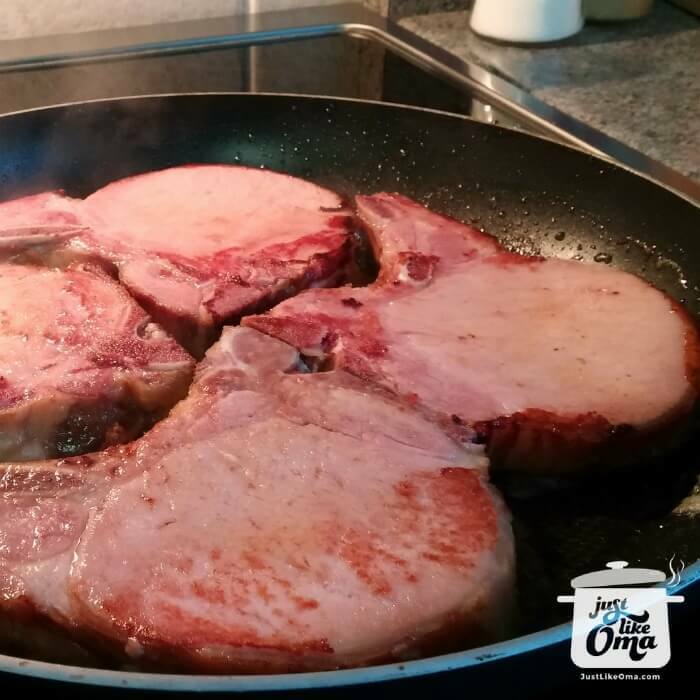 Then a thick piece of boneless cooked ham would work, although not quite the same flavor. You may want to try different brands to find one that tastes "just right". A similar flavor can be had by using a thick piece of Canadian pea-meal bacon. Again, these are just substitutes for the real thing. It doesn't get much easier than the recipe above! Just long enough in the pan to get it a bit browned and hot. Below, it is shown served with some quick and easy potato salad and some steamed broccoli. The chops are done within 5 - 10 minutes, so together with making the potato salad and broccoli, this dinner was ready in under 30 minutes, starting from scratch. All the meat needs is a quick fry to heat and brown. Often it's served with sauerkraut and mashed potatoes for a really traditional German meal. Finish off the meal in real German style by serving fruit over ice cream ("Heiss und Eis") or a pudding. 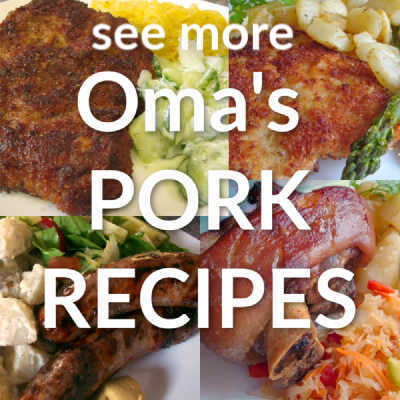 Choose your own favorite side dishes from the many German food recipes posted under or Vegetable Recipes -- great accompaniments to these smoked pork chops. Where the original name "Kasseler" comes from is unknown. It is assumed that it did NOT come from the town of Kassel in Germany. It's a salted and slightly smoked cut of pork, usually loin or neck. Often there's a bone, but this can be removed if desired before cooking. "Your kindness will reward you, but your cruelty will destroy you."